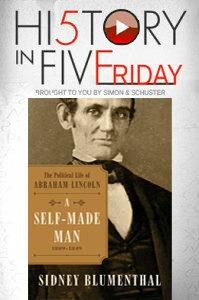 June 24, 2016 – It’s History in Five Friday, presented by Simon & Schuster — check them out at Facebook.com/HistoryInFive. Today’s guest — journalist and political aide Sidney Blumenthal — casts a look back at the marriage of the Great Emancipator, and the woman who stood at his side. Through sickness, breakdowns, the Civil War, and loss, how did this couple endure?